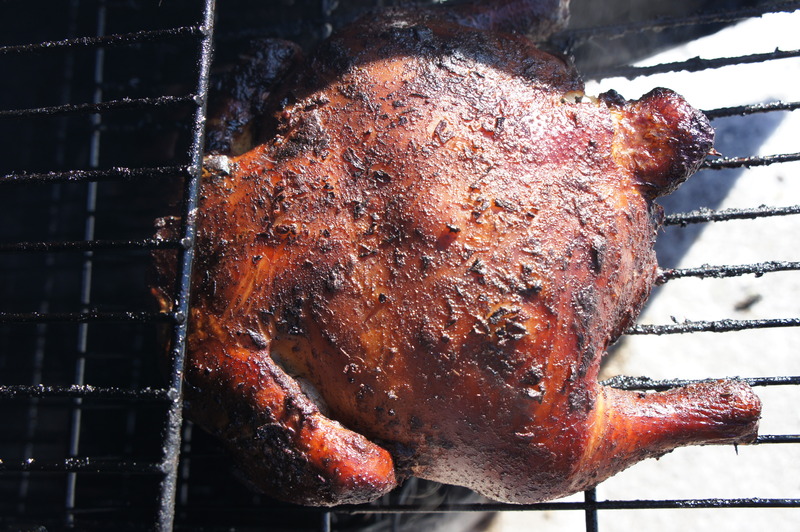 Again, whole smoked chickens are awesome, easy to make, and super cheap compared to parted out packs of chicken. 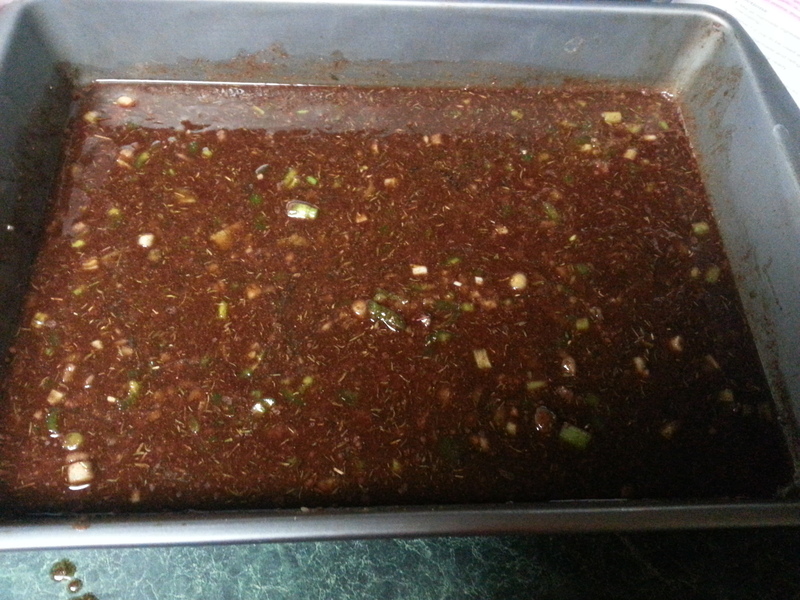 I love to marinade them for a day or so and then throw them in the smoker. 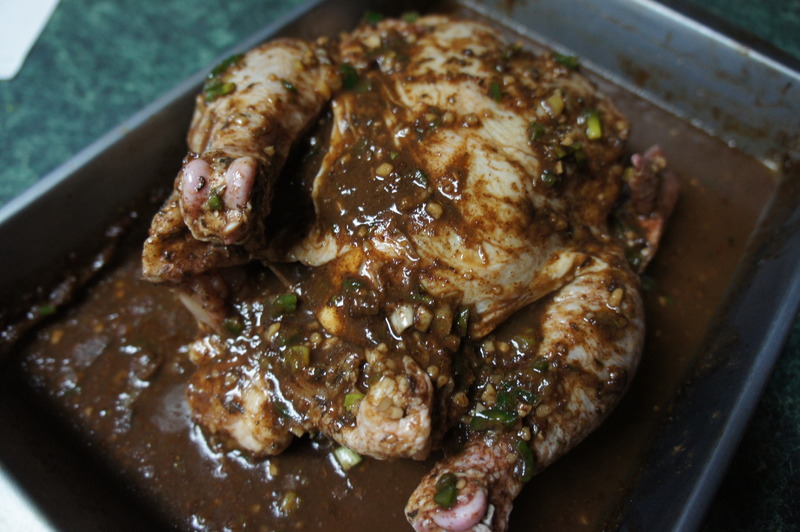 This time around, I made a Caribbean Jerk marinade. Here is what you are going to need. – A Mild Wood Chip (I used Peach) Strong wood chips will over power the marinade flavor. This marinade is super easy to put together. As simple as taking all the ingredients in a shallow baking dish and mixing it up. 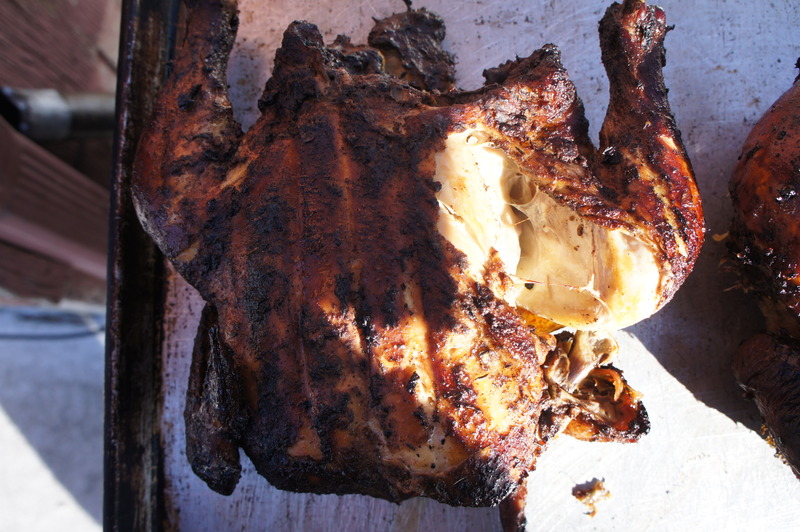 I throw in the chicken and cover it up with the marinade and rub it on the inside of the chicken as well. A good tip that I use, is to wear gloves whenever you are dicing up jalapeño peppers. If you have a small cut on your hand, you will notice the burning pretty quick. Gloves just make things so much easier! I threw the baking dish covered into the fridge for a almost 2 days . I was always told the longer the marinade sits, the hotter and more intense it gets. It did get more intense in flavor, but the heat didn’t get to out of control. A nice balance. I started up my Masterbuilt Electric smoker around 6 am and set the temp to 275 degrees. At the same time, I started to soak the Peach Wood chips. Once the temp hit 275, I threw the chicken on the middle rack, closed the door threw some chips in and poured myself a cup of coffee. I was shooting for about a 4 hour cook time, and that was about right. 4 hours seems to be about the standard time for a 6 to 7 lb whole chicken. You are shooting for a internal temp of 160 degrees. 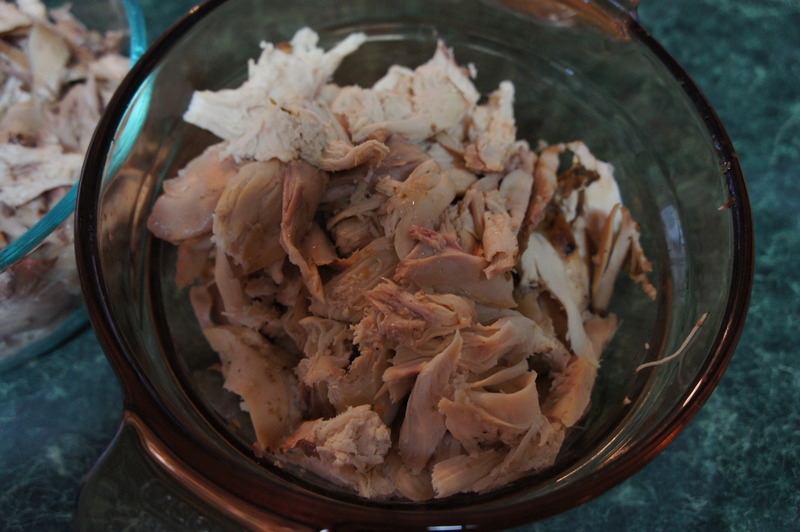 A good indicator that your chicken is done is when the the skin gets a dark brown golden color and the legs always start to pull away from the rest of the chicken. Stick your thermometer in the thick breast part and watch out for bones. Look for the 160 degree mark, and watch the juices flow out. If they are clear, your good to go. Any pink tint to it and let it go a little longer. Once you hit that temp, go ahead and pull it off and let it sit on a cutting board for about 30 minutes. This will let it set up a little, and it will let it cool down so you can pull it apart. 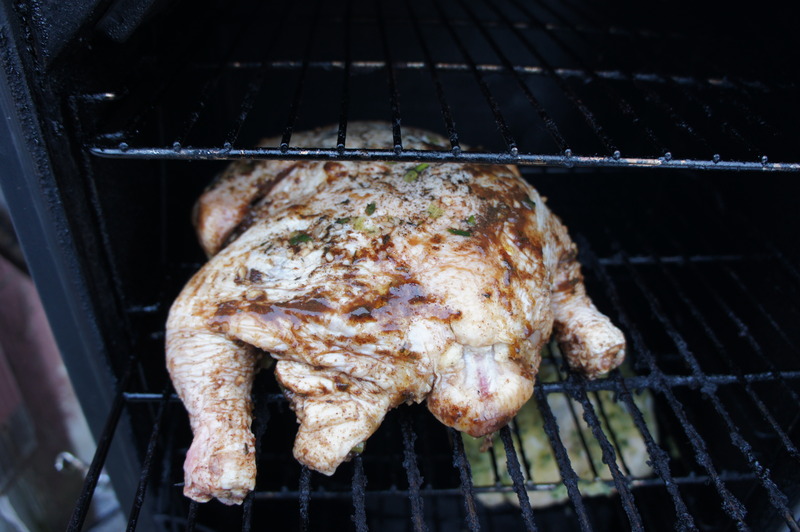 That is the great thing about doing them in the smoker, the chicken pulls apart so easy. I just shred it and throw it into a bowl. It makes for great sandwiches!